HARDCOVER Book 2: "Captain Mama's Surprise"
"Captain Mama's Surprise" is the award-winning, bilingual (English and Spanish) sequel to "Good Night Captain Mama." Little Marco leads his class on a field trip to the KC-135R flying gas station where his mom works with her aircrew. HARDCOVER format. 2nd in Captain Mama series. Printed in the USA. In the second book in the bilingual series, Little Marco becomes the storyteller as he, his classmates and his sisters, visit Captain Mama and her crew at the plane. As before, the illustrator is Linda Lens. As we did for the series debut, we're doing for the second title: we've paired 31 books with 31 embroidered patches and are offering the Teacher Pack at a substantial discount for classroom adoption. This package is perfect for celebrating Hispanic Heritage Month (mid September-mid October), Veterans Day and Month of the Military Family (November), Women's History Month (March), Month of the Military Child (April) or simply celebrating bilingual education anytime. Price includes a 30-minute Skype video call with the author into your classroom, where available. Books are printed in the USA. HARDCOVER Book 1: "Good Night Captain Mama"
"Good Night Captain Mama" is the award-winning and first-ever bilingual (English and Spanish) children's picture book about why women and mommies serve in the U.S. military. HARDCOVER format. 1st in Captain Mama series. Printed in the USA. First two bilingual books in series [ISBN: 978-0983476030 and ISBN: 9780997309003] NOT signed by author. Save money when you buy both paperback books here instead of through Amazon PLUS you're supporting a small, veteran-owned business instead of Amazon too. Thanks! This package includes a copy of "Good Night Captain Mama," a bilingual (English and Spanish) picture book plus an embroidered patch of the book's cover art. Book is printed in the USA. First two bilingual books in series, NOT signed by author, plus two embroidered patches. Teacher Pack 31 contains: 31 books and 31 embroidered patches. This package is perfect for celebrating Hispanic Heritage Month (mid September-mid October), Veterans Day and Month of the Military Family (November), Women's History Month (March), Month of the Military Child (April) or simply celebrating bilingual education anytime. Price includes a 30-minute Skype video call with the author into your classroom, where available. Books are printed in the USA. Teacher Pack 21 contains: 21 books and 21 embroidered patches. Printed in the USA. Get your own military-style embroidered patch with the cover art from the book "Good Night Captain Mama". Measures 4 1/4 "(10.8 cm) long x 2 3/4" (7 cm) tall. 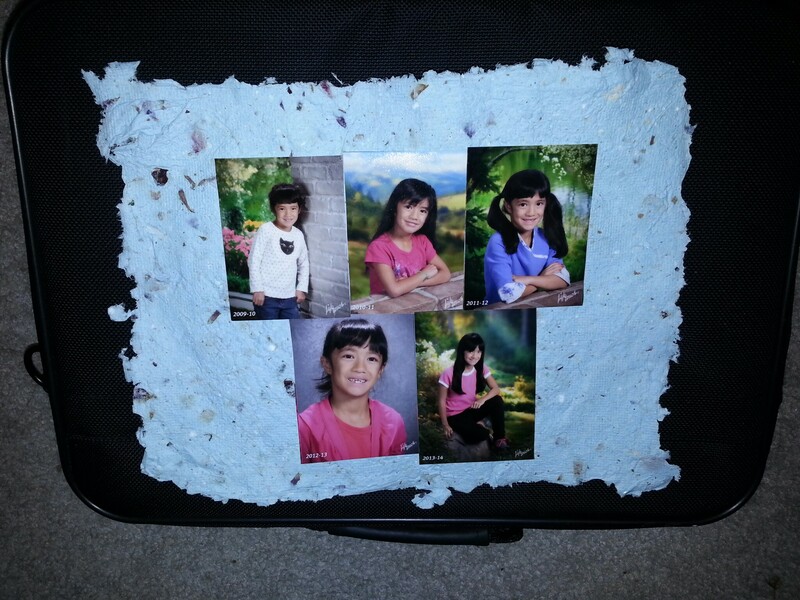 Attaches to a child's backpack or jacket with hot glue or can be sewed on too. This package includes an author-signed copy of "Good Night Captain Mama," a new bilingual (English and Spanish) picture book signed to the child or adult of your choice, plus an embroidered patch of the book's cover art. Book is printed in the USA. A three-module course + coaching. Package includes a 15-minute 1-to-1 phone/Skype coaching session with Graciela to polish your branding statement into something you’ll be proud to use in your job search, your college application essay or in your personnel package as you seek a promotion in the civilian workplace. PLUS, if you ask, Graciela will connect you with someone in her network so you can do an informational interview and grow your network! NOTE: Please click on green image at left for Program Details. 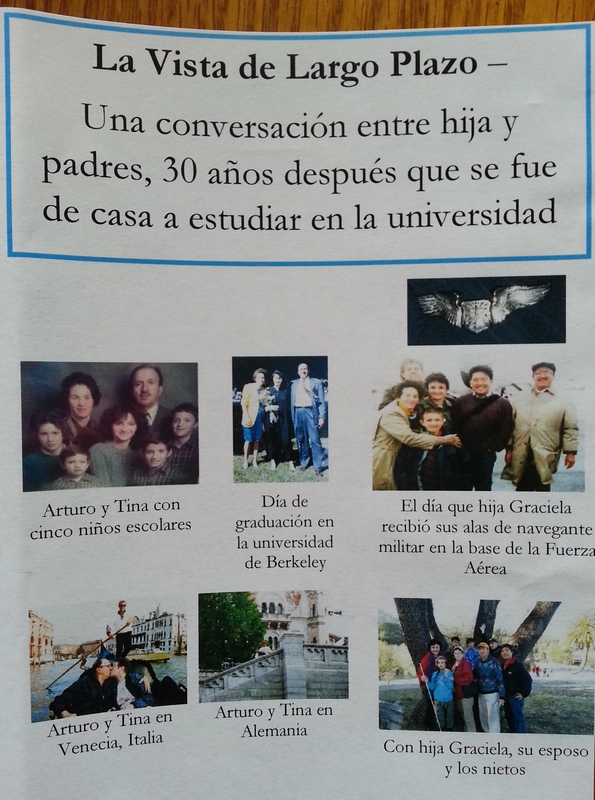 Full title of kit: “La Vista de Largo Plazo – una conversacion entre hija y padres, 30 años despues que se fue de casa a estudiar en la Universidad" (Translation: The Long-Term View: A conversation between a daughter and her parents, 30 years after she left home to study at the university) This is a unique parent-engagement kit for educators serving Spanish-speaking immigrants and their school-age children. 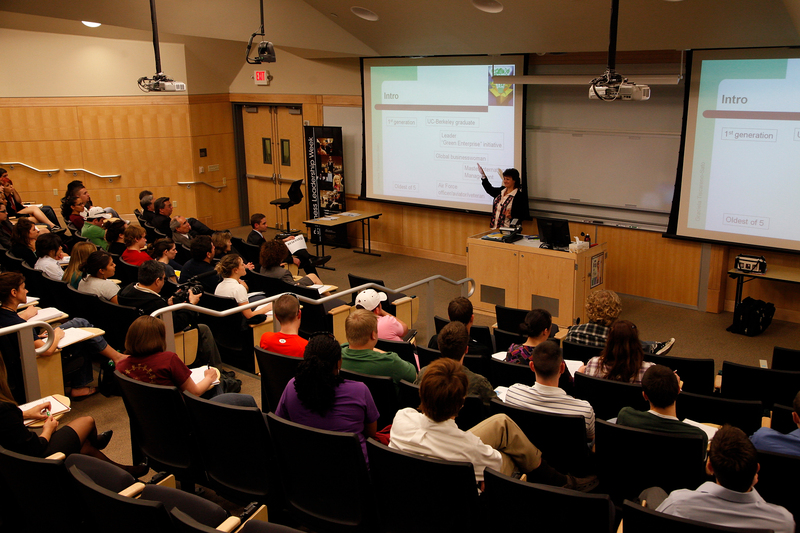 The DVD provides a long-term view of the benefits of higher education for their children and for themselves. Four questions by the daughter (bilingual award-winning author/publisher/veteran Graciela Tiscareno-Sato) with her parents (Mexican immigrants now American citizens in their 70s and 80s, with adult, college-educated children) yield powerful messages for today's Latino parents who are immigrants. The kit includes a workshop facilitator guide and a worksheet for parents to use at the workshop BEFORE they view the DVD and hear Arturo and Tina’s story. A complete transcript translation of the conversation on the DVD (in Spanish) into English is included. NEW! (Ships beginning January 2015) - This parent-created DVD is a unique and important tool for service providers serving families with children who are blind, including children who are blind and hearing impaired (as the child in the DVD is both.) It is filled with in-home philosophies, strategies, creativity and resources, coupled with IEP strategies and resources, utilized by tenacious parents intent on ensuring their daughter with dual-sensory impairments would achieve literacy. It includes raw discussion of parents’ emotional journey - from grief and loss at first learning of her blindness and later of severe hearing impairments to a thirst for knowledge, action and advocacy. Follow along and learn what Dad and Mom did at home to learn, and then help teach, Braille and continuous learning to their daughter. Length and format: 86 minutes of photo/video content includes VIDEO of child's mother presenting as she does at conferences. For parents of children with disabilities, especially for those who are blind and visually impaired (and the professionals and educators who serve them): This is a truly unique DVD of our daughter who is blind, with an empowerment message from a mother to other parents raising children with disabilities. Length and format: 30 minutes of photos and video of child in action from age nine months to six years old, includes AUDIO of child's mother presenting as she does at educational conferences. 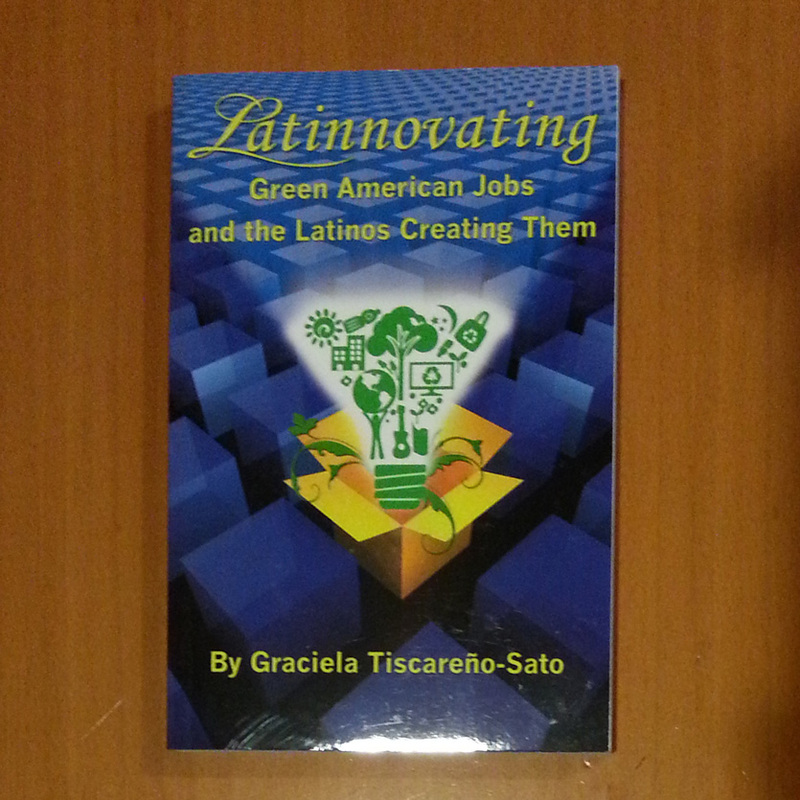 Book: “Latinnovating: Green American Jobs and the Latinos Creating Them” – ISBN: 9780983476009 (FULL CARTON of 48 new books at a discount) - 48 books at regular price = $863.52. This carton price reflects a $13% discount AND includes shipping. If you specify that you want all books signed by author, we'll make it happen. For middle and high school classrooms (high-school preparation, career planning workshops, college prep); Up to two 60-minute in-class presentations on 12+ green economy careers, real entrepreneurs and their educational pathways to leadership, innovation and small business ownership. Workshop can also be a writing and peer-editing workshop. Includes 40 copies of 4-time award-winning book "Latinnovating: Green American Jobs and the Latinos Creating Them," signed and personalized to each student. Classroom presentation can be conducted in English or in Spanish (book is in English). Tax will apply to books; Price includes author's travel expenses to anywhere in California, outside the 9 county San Francisco Bay Area. For middle and high school classrooms (high-school preparation, career planning workshops, college prep); Up to three 60-minute in-class presentations on 12+ green economy careers, real entrepreneurs and their educational pathways to leadership, innovation and small business ownership. Workshop can also be a writing and peer-editing workshop. Package includes 50 copies of 5-time award-winning book "Latinnovating: Green American Jobs and the Latinos Creating Them," signed and personalized to each student. 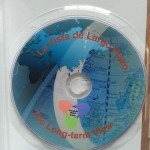 Classroom presentation can be conducted in English or in Spanish (book is in English). Price includes author's travel expenses to anywhere in the continental United States. For middle and high school classrooms (high-school preparation, career planning workshops, college prep); Up to 60-minute in-class presentation on 12+ green economy careers, real entrepreneurs and their educational pathways to leadership, innovation and small business ownership. Includes 25 copies of 4-time award-winning book "Latinnovating: Green American Jobs and the Latinos Creating Them," signed and personalized to each student. Classroom presentation can be conducted in English or in Spanish (book is in English). Tax on books will apply. Price is for 9 county San Francisco Bay Area only. This is the 5-time award-winning book about innovation, leadership and entrepreneurship in the green economy, the first to showcase creative leaders from the Latino business community. Ten chapters clearly illustrate a variety of different childhood-to-career pathways to becoming an environmentally-conscious entrepreneur. Books are printed in the USA and each is signed by the author. During checkout you can ask author to personalize it for the recipient. Made entirely by hand from shredded household papers, dry flowers, grasses, with various scents added, this lovely, textured paper makes an excellent matte for framing children's school pictures and more. Can be used as a greeting card too. Made in our backyard entirely by three children, including one who is blind, with minimal adult supervision to teach the art of creative reuse. Price includes a large 8"x10" sheet and one small sheet 3" x 5" size. I can’t wait to read your new book! Evan is excited too, after touring a KC-135 at the Pensacola air show this weekend.